Fact: Men and women are equally likely to have fertility issues. Fact: Male factor infertility (MFI) is the cause for 40% of fertility issues couples face. If men experience fertility issues to a similar extent as women, shouldn’t the male-to-female ratio in fertility clinics reflect that? Unfortunately, that’s not the case. Women find themselves to be the ones seeking help and going the extra mile – even when their male partner has been tested and diagnosed for MFI. Technologies like assisted reproductive technology (ART) excuses men from taking action because all they have to do is successfully produce sperm. However, what men don’t realize is that the ability to produce sperm is just the tip of the iceberg. This means low sperm production, which can be due to a number of reasons. In some cases, low sperm count is due to poor lifestyle choices that can be easily reversed to improve sperm count. Read more about causes of MFI in my article. Normal sperm count is ~20 million sperm/mL. Simply put, the sperm have trouble getting where they need to be once they enter the cervix. This can either happen because the sperm have trouble swimming straight upstream, or is too slow. This means the sperm has an abnormal size and shape. 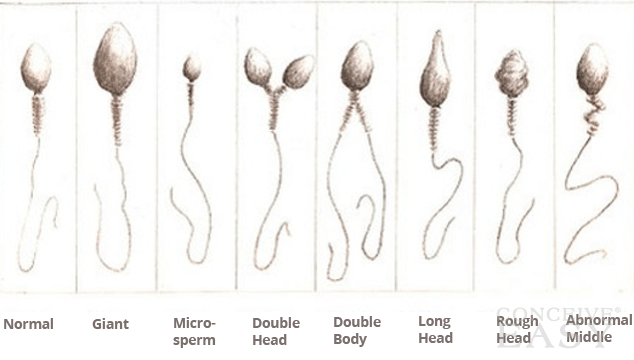 A normal sperm looks like a tadpole: it has a head, a mid-piece, and a tail, all of which perform specific functions. The enzymatic protein in the head penetrates the egg; the mid-piece contains mitochondria, which fuel the cell; and the tail’s whip-like action propels it upstream. Misshapen sperm may not be able to swim or to penetrate the egg. This means breaks in the sperm’s genetic blueprint. In this case, a sperm still may be able to fertilize an egg but its genetic defects will impede normal development of the pregnancy, and may increase the risk of miscarriage. The sperm is essentially being targeted and broken down by the body’s own immune system. To prevent this, sperm are normally produced in isolation and out-of-contact with the rest of the man’s body. However, damage to this barrier can expose the sperm to the body’s own antibodies (natural defence machinery). Men can have a number of fertility issues as well. However, because men can be unaware of this, they inadvertently put the onus of keeping things going on women. Whether tackling their own fertility issues or visiting on behalf of their male partner, women are usually the first ones to seek help from a fertility clinic. This needs to change for the health of both partners, and the relationship overall. Fortunately, testing a man is simple. All he has to do is ejaculate into a plastic bottle in the comfort of his bathroom and deliver it to the fertility clinic for testing. If you are under 35 and not pregnant after a year of trying, or over 35 and not pregnant after six months of trying, you and your partner should both be tested, as it’s equally likely for either of you to have fertility challenges. I am very impressed by your site and your posts they very nice and very useful to us. You made a good site and giving us such a great information on this topic it’s very interesting one. Thanks for sharing the best posts they amazing and very nice.